Happy Birthday, Let's Live Forever! | Let's Live Forever! Yes – it’s Let’s Live Forever’s first birthday today! On a cool crisp autumn morning in 2008, a whole YEAR ago today, little LLF was delivered into the nurturing arms of his new database and WordPress installation, on a server at DreamHost, which I thought would suit him nicely. I gave him the name Why Live Forever?, intending that together we would talk about reasons why people might want to live forever. Unfortunately, it turned out the server wasn’t quite large and comfy enough… feeding him and changing the bed linen turned out to be painfully slow, so I had to move him to a new server, at a small company called Little Oak. He got a brand new database and WordPress installation… this pleased him greatly, but the transfer took about 2 weeks and the whole thing was a pain in the neck for me. Over the next few weeks, little Why Live Forever? grew, though it was a strange, lonely and scary world he found himself in. Would there be anyone to keep him company? Before long some friends came and left comments, and he and I both cheered up considerably! Except it became clear his name wasn’t very good, so I took a deep breath and presented him with a new domain name, and yet another database and WordPress installation. As I had no idea how to transfer a blog, I copied over all his posts and comments by hand, one by one. Luckily he was still pretty small at that stage. In those days I dressed him in some clothes called Misty Look. Some of you might remember how he looked when he was a kid… here’s a picture! The header is a photo Frank took at 7 a.m. at a party we went to—the drummers were greeting the dawn, after a very hot night. I was trying to find some way of making little LLF look exciting—don’t know if it worked. We were both pretty scared about our foray into the blogging world, talking about physical immortality and all. LLF and I were dropping in on other bloggers, and they would reciprocate, sometimes finding the weirdest ideas they had ever seen. This was embarrassing at times, but we got over it. After a while I hankered for some clean, white, grown-up clothes for LLF. I looked and looked and nothing quite suited until I found an outfit called Thesis! He feels comfortable now, and ready for action! And so do I! Needless to say, little LLF wouldn’t have thrived without some friends. These days he has a Top Commentators plugin, which tells us which friends have dropped in to chat the most times. Evelyn has been writing about Akashic Records, and funnily enough, Dot has also written about her experience with Akashic Records. Jannie, the Mistress of Funsterment, often writes about singing and songwriting, while Ribbon from Perth shares her internal map of reality with us, and has been known to write about the pursuit of desire. Our friend Tess has written about celebrating in difficult times (boldly). Davina has written about believing in yourself. Vered, a mommy blogger, has written an article about children’s self-esteem. Patricia often writes about important issues, for example funding for treatment for cleft palates, and Stacey writes about creating balance in life, such as in her article about struggles in life. On Daphne’s blog Joyful Days she writes about happiness and abundance, and Marelisa writes about creativity, productivity, simplicity and abundance, and has many happiness tips to share. Tom writes about working for yourself, and growing your business. Jenny, who has a blog about healing, writes about healing pain from within. Kelly writes about life and everything, such as in her articles about enduring friendships and backpacking. Lance’s blog is all about life—one of his articles is about life lessons. On Miguel’s blog he writes articles about things like focusing on your strengths, and Natural has been thinking out loud about whether to be anonymous on a blog. Barbara has a blog all about blogging tips, which help many a blogger. Last but not least is The Urban Panther, life muser, who has been known to write about social events. Thanks everyone—bloggers and non-bloggers—for helping me make it through the first year. Here’s to new developments and growth in all our projects! I love the photo! You looked really cute. And congratulations on LLF’s very first birthday! If you can blog for a year, you can probably blog forever! Thanks for the link love too. One year! Happy Birthday to LLF! And…you know…based on the of this youngster – there will be birthdays that go on for a long long long time (forever!)!! It’s great to be hear Robin – and it’s fun to be here today and think back to those early days – seeing the younger picture of LLF brings back fond memories for me… It has indeed been a great pleasure to have been here with you over a good portion of this past year! My first visit to your site is on your first birthday. How nice? Wish you a Happy Birthday!!! :). May you blog forever !. Happy Birthday Robin – That came round really quick. You look so cute in your Birthday pic. It is weird how so many of us who comment on this blog have tried Akashic Records, as it’s still a fairly new thing. I’ve read most of these blogs but I don’t think I’ve checked out Daphne’s yet so I will be looking. And I’ve read Ribbon’s blog but I did not know she was from Perth. If it wasn’t so far away, I think that would be my first choice to move to. But I’d never be able to afford to visit the UK. Happy Birthday LLF! Thanks so much for the link love and for your friendship and support. All the best for your future projects Robin in work and life! thank you again — for everything! Ah, what a wonderful link, thanks dear Robin. And HAPPY FIRST BIRTHDAY, LLF!! Interesting you gave “him” a gender. I’ve never considered before if my “Den of Funiquity” is a boy or a girl. What do you think? So that house is still in your family? Can’t wait until I get to Oz and drum with you. Eventually…! Happy Birthday Dear Lets Life Forever! Congratulations Robin! You have been on a remarkable journey and it has been an honor to call you a friend. Okay, so you may be an e-friend. But friendship is friendship. Congratulations on this wonderful milestone – your community is a terrific accomplishment! Happy Birthday! Your mom, Robin, also looks adorable in that photo! I noticed your blog long ago by the comments you leave at other blogs. Honestly, I didn’t think you will last this long. And at first, I didn’t get your idea of living forever. As Akashic Record Reading specialist, I know death is not something we need to be afraid — I’d rather be concerned about people’s fear of death. But the strangest thing is, with the light ascension going on, your idea and mine are mingling in a completely unexpected way! Souls can live forever, so it’s just a matter of developing a suitable house for the soul. In my idea, that is the lightbody, not this physical body, but still, I’m intrigued with your idea. And you have such a keen awareness about what is going on toward 2012. Happy Birthday LLF! I like that you haven’t just been blogging passively Robin, but instead you’ve been taking steps to make your blog better and better. It definitely shows. Happry Birthday LLF! 🙂 I’m sure a blog with that name is due to last for many, many years to come. And thank you so much for the link. Happy birthday LLF! You’re always a good read and little SHE-POWER enjoys coming over to play. Thanks for the inspiration and for opening my mind to the possibility that I may not just be a goddess (which I already knew), but immortal as well. I look forward to another year of fascinating discussion. Kelly@SHE-POWERs last blog post..What’s the Secret to Enduring Friendships? Wow aren’t birthdays wonderful! Thank you so much for the shout out, I am just getting back up and running after another computer glitch and it was fun to find you there first thing. 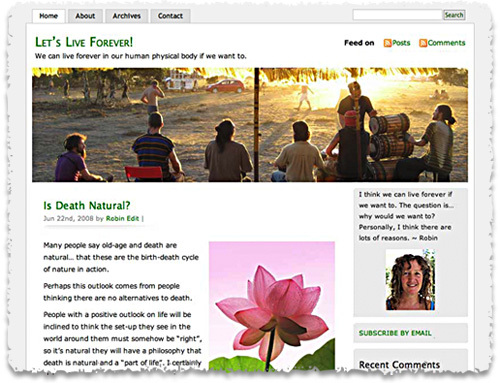 LLF you are a very inspirational blog and I do so want to live awhile longer in this form…I love coming and looking for the new and older posts and just letting them soak in and renew. Wonderful picture of Robin….to top it off! Thank you for putting this together and Many, many more years to come – I am sure of it! Patricias last blog post..Announcing a Writing Contest – With a Financial Incentive! Happy Happy Birthday! And I am thrilled to be a friend of both you and LLF! YES! YES! YES! to much of the info you are sharing here!! Thankyou! As a practicing Rebirther/Breathworker I have been unravelling the old constructs about death/life cycles that seem to have been in place ‘forever’ YET!! Says Who?? For me the power of Conscious Connected Breathing in enough to challenge all the old programming, and to open me (& my clients) up to ever increasing levels of LifeForceEnergy!! @Daphne – thanks – we can thank Mum for that. I don’t know if I’d want to blog forever! @Lance – I’m glad you have fond memories of the early blog – it has been a great pleasure to be with you too, Lance! @Vikum – hi there and welcome to this blog! I see you just started recently – good luck with it all! I love your title concept – ‘Thinking Park’. @Cath – it sort of seems quick and slow at the same time. I guess we are a bunch of people who are willing to try things on! What about Melbourne? @Jenny – my pleasure! And you too! I really appreciate your support, Jenny. @Jannie – the funstmeister! I don’t know what gender your DOF would be – maybe you could make a new one up! Dad lived in that house from 1926 till he and Mum sold it and moved to the country in 2000. @Stacey – yes – an e-friend is still a real friend, especially with the way blogs work. For some reason I have always seen LLF as a “he”. Dunno why. @Betsy – you were borned just a year after me! I have a photo of me in a tub that is very similar to yours. Thanks Betsy! @Akemi – thanks Akemi! Perhaps the physical body and light body can become one and the same – the physical immortality philosophy is about getting to that state through overcoming death, rather than dying. Great to see you here, Akemi! I hope you enjoyed your stay in Australia. @Marelisa – thanks Mare! You are not exactly a “passive blogger” yourself! I see your blog and other projects are going really well – and you have a new eBook to add to that! @Miguel – thanks Miguel – and I’m honoured to be your friend, as well. @Vered – thanks Vered! I’m glad you liked the link ;=) Yes – to another year. @Kelly – Thanks! LLF and I enjoy dropping in on SHE-POWER, too. What can we call a blogging goddess (I know a few)? I think Bloggess has been done. Thanks for your support, Kelly. @Patricia – You have had FAR too many technical glitches for one blogger to deal with! I hope they are over! Thanks for visiting, Patricia – I am really touched that you find my posts inspiring. @Urban Panther – thrilled I am, also. I trust the new lair is still comfy and nurturing? Cheers, U.P. @Janina – Wow! A real, live breathworker with a blog! Welcome, Janina – breathwork is such a great way of cleaning programming right out of the body. Thanks for visiting! Happy, Happy Birthday to you and LLF! Your account of LLFs journey made me smile. And that picture of you is adorable — you look like you desperately want to dive into that cake, lol. Cheers to living forever Robin. And thank you for the link share. Hi Robin and Happy First Birthday. How exciting. I love how you shared the journey of your blog, as well as the screen shot of what it used to look like. Your new thesis theme suits you well. Thank you so much for the link love. I look forward to your future thought provoking posts as you continue on the journey of blogging. Thank you for the link love and for all you do. @Davina – ha ha – I thought a few of you might relate to that. Thanks about the picture – the look is pretty funny. @Barbara – It is exciting! We had a bottle of champagne tonight, and then went down the street for tea. Thanks for all your support, Barbara – for me and everyone else. Such a passion for what you truly believe, it’s such a great pleasure to be your partner and share your passion. Happy Happy Birthday!! How awesome! It seems that I’ve known you for a good many months as I recognize the old theme that you used to have. Reading your history made me kindof wish I change the domain name to my site too. I was thinking about it early last year but didn’t at the end. I don’t think I want to do a transfer now as I simply don’t have time to republish my posts one-by-one. It was also nice to connect with you over Skype. I love how you are, look and feel!! I hope to read more of your thoughts on being young forever! I also look forward to building a deeper connection! yay for LLF, i remember when he was a babe and now he has on big boy clothes. congrats on turning 1. it’s always nice to stop by for a visit and reading your thoughts on life and never dying. i know it’s possible. @Frank – thanks sweetheart. It’s a pleasure being with you, too, and I feel so lucky we share so many passions. @Evelyn – My pleasure! Can you just export a blog, from inside WP? – it has export and import in the tools section. I don’t know whether that includes the comments, too. And transferring the uploads folder would be a pain. I’ve loved meeting you, too – I went to Singapore once, briefly, and it was very steamy! @Natural – I remember your first visits – thanks for dropping by in those days. I’m very glad you think it’s possible! Hip Hip Hooray!! Congratulations and best wishes for all the years ahead! PS how loved were you… yr first bthdy cake is so beautiful & elaborate. Ribbons last blog post..Just for Fun! Happy Birthday! What will the next year bring? I wonder how many of us will still be blogging? I for one loved your old photo. It made me want to come party with you. I’ve done some drumming and howling myself. 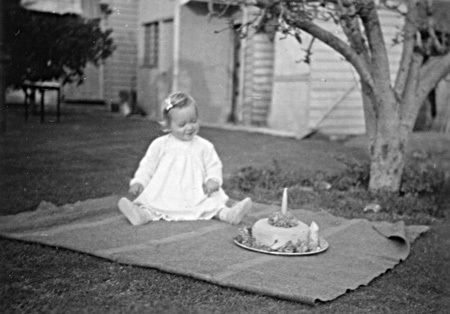 @Ribbon – yes I noticed that too, about the cake and my outfit – I suspect Mum and Dad doted on me! Thanks for the congrats! @Tom – Thanks about the photo Tom – I didn’t want to drop it, but it didn’t really go with the images I had on the posts. Tough decisions! Thanks for the birthday wishes – drumming with you (and Jannie) would be quite something! Happy Birthday to LLF! Wow a entire year calls for a big celebration. I love the picuture of you and thanks for giving those of us who weren’t there at the beginning that picture as well. Celebrate! Tess The Bold Lifes last blog post..Are You Bold Enough To Forgive Yourself & Others? Congratulations! This is a really cute post! Happy Birthday, Let’s Live Forever! I’m so glad I found you and learned from you. May you go on and on! And Robin, I’m so glad to know you through your great comments in so many places. You and Frank are such an inspiration, living your beliefs and making music. 🙂 And thanks for the link, too. @Tess – Thankyou Tess! Did I mention I love your jumping goldfish? We did celebrate – I have recovered now. @Dot – well now thankyou Dot! It has been great to get to know you too – we bloggers are all going for it, I think, in various ways. Congratulations to your blog’s Birthday. This is my first time here and I got the feeling that this is a loving place. Your baby photo is so precious. Thank you for sharing and you have a very nice blog. Giovanna Garcias last blog post..Mistakes are Good! Well, I’m showing up to the party a bit late… but finally made it over. Happy Day LLF, hope you get some more good years here. The Photo is great. (I bet you have changed)! happy birthday to your blog, and may your live forever… You have created a little gem in the blogosphere…thank you…. @Giovanna – hi there and welcome to this blog! Thanks for the birthday congrats! @SnaggleTooth – hi there and welcome to you too! Glad you made it – and yes, I have changed a little! @rainer – hi there Ray! Your own blog is rather a gem, I think. Thanks, Ray – and thanks for being one of my visitors in those strange, lonely, early days. I love it as our blogs grow and change, Tom’s comment is interesting, will we all still be blogging in a year? I wish I am not too late to say Happy Birthday to LLF. Something that I want to know from you, that is, did you dreaming about live forever? Do you seriously? @Suzie – thanks Suzie! Never too late! @Tikno – hi there Tikno – great to hear from you again. LLF and I both thank you! Yes – I do seriously see myself as living forever, in the eternal now, i.e. not aging and dying, and becoming self-realised (along with everybody else). This is an inspiring and amazing piece. Throughout my life I have searched for a path to immortality. Now, having found that path, I am so glad that others like you are spreading the good word about my eternal teachings. Continue the good fight, keep striving for immortality, and remember– never lose hope! For when we lose hope, we lose the fight against death!